In September 2017, Canadian indie rock band Arcade Fire embarked on their first international tour after their single, Infinite Content, hit number one on the Billboard chart. Traveling 451,851 miles across over 50 locations, the band performed on a stage supported by an AV system featuring a video wall, 92 amplifiers, 56 subs, lighting, 128 loudspeakers, and 8 coaxial speakers. The use of a large stage for the performances meant that the AV system was at risk of common problems that plague touring installations such as complicated cable setup, equipment placement, daily setup logistics, and the involvement of multiple manufacturers end products — all needing to be set up and dismantled in high speed to accommodate the busy tour schedule, while also supporting the high-quality audiovisual experience that Arcade Fire envisioned for their fans. Arcade Fire's Infinite Content tour featured AV equipment from Meyer Sound, Black Box Music, Extreme Networks, and L-Acoustics. The AV system comprised devices from a variety of manufacturers and needed to be able to be easily and consistently installed by the many teams involved in stage setup. Integrator Solotech and audio design team Méduse Audio brought extensive experience including design and integration for music giants like Radiohead, Florence and the Machine, Celine Dion, and Bette Midler, and had previously collaborated together on other tour projects. 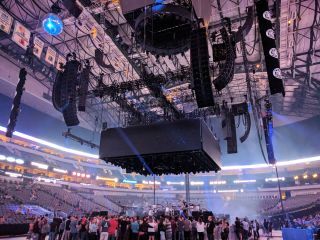 For the Arcade Fire tour, they teamed up again to design the system with support and equipment from manufacturers including Meyer Sound, Black Box Music, Extreme Networks, and L-Acoustics. The integration teams knew that a large and complex cable setup for the AV system would be time consuming to install in the many locations and difficult to maintain across the duration of the tour. In the first approach to the system design, Méduse Audio and Solotech embarked on testing in Montréal to address the challenges of the installation. After extensive testing, it was determined that the system required an approach that would allow for greater control and precise management, while maintaining high sound quality with no audio drop-out. In the past, Solotech has used an AES infrastructure but, according to David Brazeau, Solotech audio technical advisor, “that can be challenging on a larger project, and we preferred having both the control and the audio embedded on the same network.” L-Acoustics introduced AVB as a possible network solution, as their amplifiers, subs, and loudspeakers are Avnu-certified. During testing, Méduse and Solotech realized the “sonic advantage” of AVB, and decided to implement it to ensure reliability, lesser setup time, synchronization, and consistent audio quality on the tour. The system would become one of the largest deployments of AVB in a tour system, ever. Using AVB ensured the reliability of the system throughout the tour and helped reduce the number of connections between devices. It also offered low-latency and improved synchronization and reliability for the audio and video systems. “The installation had a mix of daisy chain and star typology, letting us see all the amplifiers across five locations, connected with fiber optics and an Extreme Networks Gigabit AVB-enabled switch,” said Brazeau. “Once the AVB stream is locked, it’s virtually impossible to lose it,” said Germain. He added that the team didn’t need to tweak or create additional physical connections, which reduced the installation time at each destination, and secured the reliability of the system by reducing the chance of cables going offline from breaking. Using Avnu-certified devices was a crucial component for ease of use of the network and setup with various manufacturer’s products. The Infinite Content tour ran smoothly, having benefitted from streamlined setup, quality sound, and system reliability provided by the AVB network. The teams could react quickly to accommodate changes that needed to be made along the tour, without having to make cabling repairs or changes.